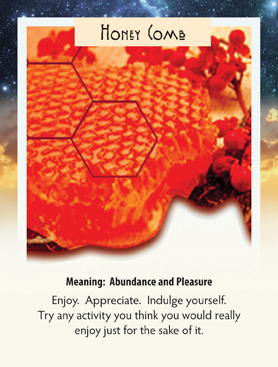 This week we have drawn the Honey Comb card. That tells us our souls would like a little comforting right now. Not a bad assignment! We tend to set up rules during our lives about what we can afford to do for ourselves. By afford, I mean afford the time, the calories, or the money. Those guidelines are good to have as we move through life. But sometimes we need a break from the rules…even just a little break. When was the last time you went out for an ice cream cone in the middle of the afternoon? Or when did you last allow yourself 15 minutes to lay on the grass and gaze at the shapes in the clouds? If you could do absolutely ANYTHING you wanted right now, what would it be? If your desire is impractical (like getting in a plane to go to France), think of something you actually can do and then do it. The only barrier is really your attitude about it…and you have control of that, don’t you? So your assignment is to ENJOY! Not bad eh?